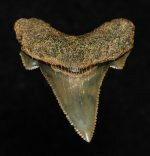 Carcharocles angustidens : Fossils Online, Welcome! Not perfect, but the colors should make up for it. Excellent quality that makes up for the size. 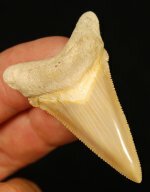 Very nice, sharply serrated tooth. Tiny nick on tip, but the color and preservation should make up for it.